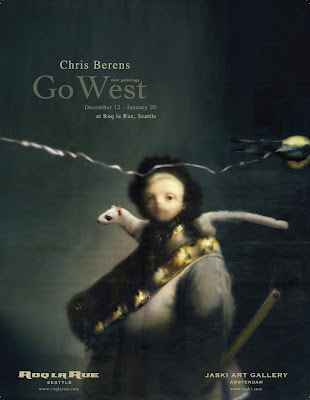 Returning visitors to Erratic Phenomena may recall that I wrote about the astonishing Dutch painter Chris Berens a few months ago. Shortly after posting, I was flattered and thrilled to be asked if my little writeup could be used as the introduction to Chris' new book. Entitled Ninety-Nine, the book will be released November 1st in a limited edition of 2500 copies, and can be ordered from Jaski Gallery in Amsterdam. Here are a few examples of what can be found inside. 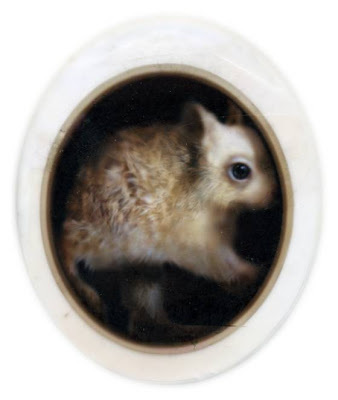 These 99 small works, originally created for the special edition of 2239, an overview of Chris Berens’ work to date, are tiny porthole views into his luminous visions. 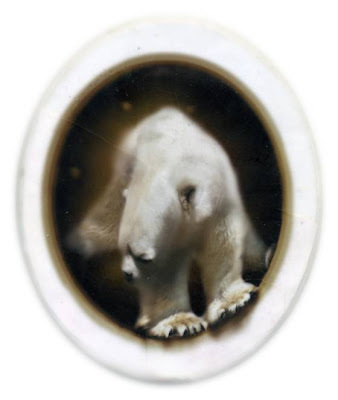 They have qualities reminiscent of the daguerreotype photographs of the 1850s, which are often vignetted, imperfectly focused, distorted by primitive lenses and damaged by the passing decades. 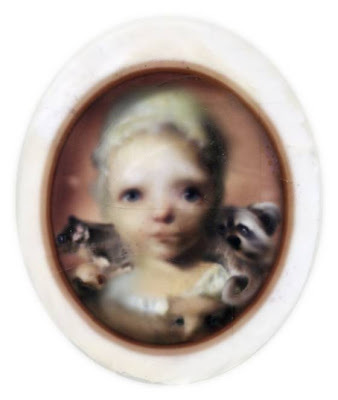 Like those antique photographs, these miniature paintings bring us a rare and fragmentary view of a time and place that we can never visit. They will not divulge the true nature of what is portrayed, but will forever bear witness to its existence. On December 12, Chris will be in attendance at the opening of his first American show at Roq la Rue in Seattle. Hope to see some of you there! In the meantime, you can glean some insight into his singular technique here – and pick up the latest issue of Hi-Fructose for an in-depth interview he recently did with Kirsten Anderson. 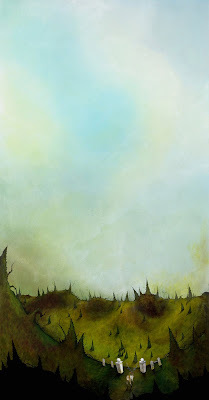 Regular visitors to Erratic Phenomena may remember that I posted a rather brief and fragmentary glimpse into the work of painter Scott Belcastro in the spring. Since then, I have had the opportunity to get to know Scott a little better, while at the same time, he has been developing a really impressive body of work along the new theme he had just begun to explore when I first fell in love with his eerie and magnificent "As Blue as my Soul Will Go." 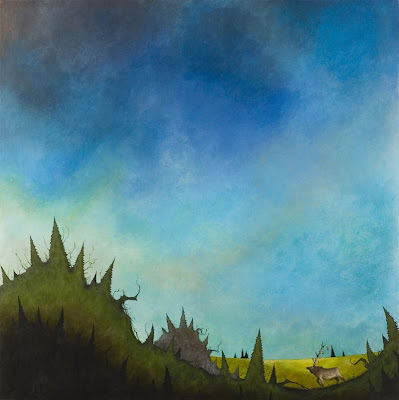 He's had quite a bit of success this summer with the forest series that developed from that breakthrough painting, and we'll have an opportunity to see the next phase of this woodland adventure on November 8th at Cerasoli:LeBasse Gallery. "Somewhere in the Forest, Somewhere in the Thicket"
Scott's paintings work on several levels, with the deepest one being quite personal – expressing a realization or a struggle, grasping for something elusive in himself, or searching for something important that has been inadvertently lost along the way. 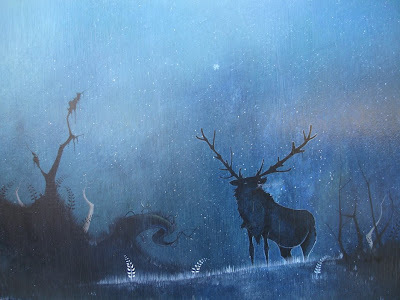 On the surface is a narrative about a little boy and a stag on a journey or quest through a mysterious forest landscape. In between lies a thicket of subtle, almost subliminal symbols. One of the most striking characteristics of Scott's work is the contrast between his vast, dramatic skies and the meticulously detailed landscape below (an aspect of his style that is impossible to fully appreciate online). Often, his landscape takes up less than a quarter of the frame, almost serving as a framing device for the heavens pulsing with color above. 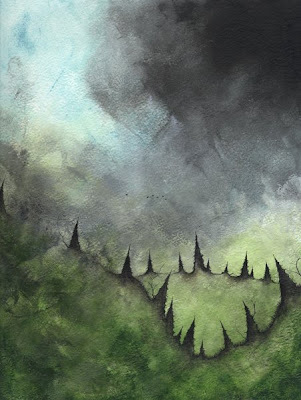 Despite his emphasis on the awe-inspiring sky, every blade of grass, each vine and leaf is precisely and specifically delineated, a marvelous but rather unusual choice that gives his paintings multiple levels of focus, drawing the viewer inward both physically and emotionally. "As Blue as my Soul Will Go"
Interestingly, Scott's own focus rarely seems to be on the characters in the landscape, but rather on the natural elements around them. Perhaps unconsciously, he makes the landscape itself the central figure in his narrative. 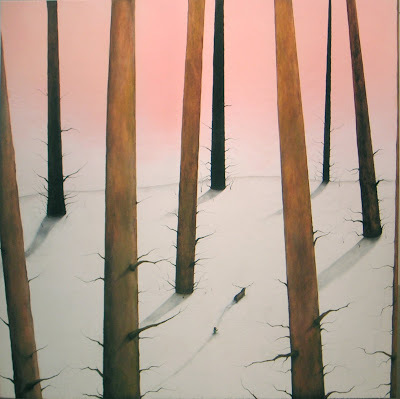 His forest seems very alive, imbued with a sense of awareness – as if it is watching the story unfold within itself. 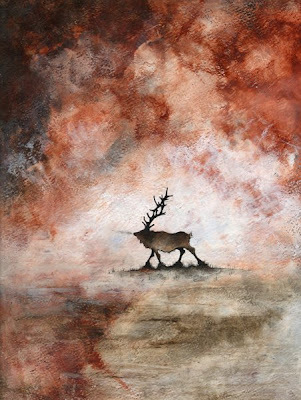 When I first saw Scott's work, I was immediately struck with the idea that the stag guardian figure that appears in so many of his paintings could be the soul of the forest incarnate. This quality of Scott's work seems to suggest an element of animism – a primitive religious concept which posits that the world around us – each mountain, stream, tree and rock – is inhabited by souls or spirits which can communicate and interact with humans. Many of you may have encountered this idea as the thematic underpinning of reverence for nature in Hayao Miyazaki films like Spirited Away and Princess Mononoke, but it is common to folk religions around the world. It's one of the most primal forms of belief that exists, and as such it's essentially hard-wired into our collective unconscious – so in truth it's hard to say if the association emanates from the artist or the viewer. Nonetheless, it imbues much of Scott's work with a sense of mystery and anticipation. "Let's Go Back the Way We Came"
Scott is hard at work preparing for his upcoming show, but he was kind enough to take some time to answer a few interview questions for me. Erratic Phenomena: You grew up in upstate New York, and I've gotten the impression that your childhood was a wonderful, almost mystical time. When you were a kid, you spent a lot of time in a nature preserve with the delicious name 'Back Secret,' and you take much of your inspiration from those memories. You've even said that sometimes you worry that the childhood memories you draw from will dry up and you'll be like an empty well. What makes that place and time so important to you? Scott Belcastro: I guess your youth is always your best time in life. I felt like I was soaking up everything I saw and it was going in so beautifully... There were no mistakes or wrong feelings, just enjoyment and a sense of emotional freedom. The woods always let me have that freedom, and asked for nothing in return – but only to appreciate. "It Ends the Way It Begins"
EP: You've said that one of your greatest influences is your grandfather John Belcastro a.k.a. Jack Bell, who was a commercial artist in upstate New York for 40 years. After serving in the Navy in World War II, he trained under seminal Tarzan cartoonist Burne Hogarth at the School of Visual Arts on the GI Bill. In the latter years of the Golden Age of Comics, he inked dozens of Korean War comics and horror comics for Fiction House under the name Johnny Bell. When you were a boy, he exposed you to the work of the great painters, including a few of your all-time favorites – Jackson Pollock, Edward Hopper and J.M.W. Turner. Could you tell me a little bit more about your grandfather? Did he teach you to paint, or did you pick that up elsewhere? SB: I watched him paint a lot – mostly signs. I would go in the basement where his studio was and look at the brushes soaking in paint thinner... and smell the oils drying on the wood... all the rags with the paint on them. I never thought of myself as an artist, but something about the energy in that room gave me a good feeling... and I was only seven. I started painting later on, when I got in high school. I would paint all the time, trying to figure it out. I knew I didn't want to go to school to learn how to paint – something about that made me uncomfortable – so I just figured it out on my own. EP: When did you realize you were going to be an artist? Was there something in particular that gave you the confidence to take that route in life? SB: I just knew... When something fits, you wear it. What We Were Looking For All Along"
EP: You've said that the lonely atmosphere of Hopper's paintings intrigues you, and I assume that you find Turner's dramatic skies inspiring. Are there other artists you find particularly compelling right now? SB: I have always liked Sam Kieth, creator of The Maxx – his style has always inspired me. Recently I have been enjoying Ian Francis... wow, that guy has some confidence. Bill Watterson's Calvin and Hobbes – it may seem like just a comic, but it dives so much deeper than that. I also like Chris Appelhans a lot. EP: Much of the work you did previous to this year's forest series focused on cozy little houses in perilous situations – threatened by fire, thrashing seas, falling bombs. You once wrote, "I am not happy about the destruction the fire causes, but I am put at ease by the visual of it." 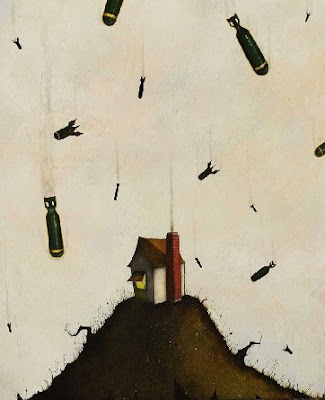 Is there something liberating about destruction? SB: I have always looked at destruction as a way of starting new. When something is gone, you have no choice but to rebuild it – make it better, stronger. The problem is you never have roots, and it becomes easier to just destroy rather than to repair. I guess it's a way of avoiding something – it is more bad than good in my case. EP: Do you see those imperiled houses as a separate phase from your current work, or is your forest series a logical extension of what you were trying to achieve all along? SB: The houses and the forest are the same painting to me – I just choose the things I want to focus on more. Eventually I will put everything together as a whole. It gives me a chance to give different bodies of work to the viewer, but it's still recognizable as my style. I want to give more than an artist who does the same thing over and over again, using the same technique and the same focal point in the work. "Over that Ridge and Beyond that Hill"
EP: Your immense and evocative skies are one of the most compelling aspects of your work. In a recent interview, you said, "Usually when I get that background done, I hear everything I need to hear... I put the most energy and time into my backgrounds. They are telling you something – actually, they are screaming at you." 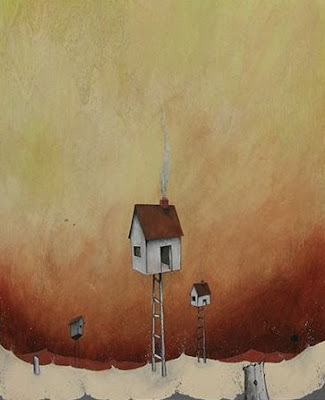 You've also mentioned to me that you often feel like you're screaming when you're painting, which is very interesting. Could you elaborate on that a little? SB: I think a lot of people feel like that... so much they want to say about how they feel, but it comes out as a whisper in a sea of voices. It's frustrating. I like how I can yell louder and more people hear me when I paint it. It gives me an advantage. 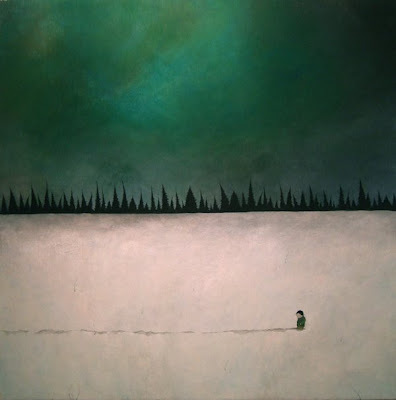 "Where Are You When I Need You"
EP: You seem to have a particular affinity for snow, which is one of your favorite subjects. Is that fascination mostly driven by nostalgia for winters past, or does snow have a deeper emotional or metaphorical meaning for you? SB: I think the snow is the clean slate in a way. It also conveys silence to me. It's lifeless and still... and I feel a thousand feelings at once looking at it in the right setting. "At What Point Will You Stop Leading the Way"
EP: In a way, your forest could be an entity in itself, a matrix of interwoven living things bound by a single life force. 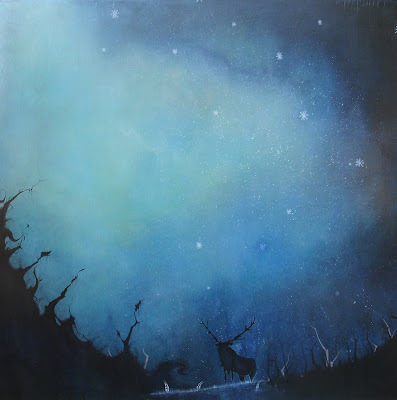 Many of your paintings bring to mind animistic belief systems such as Shintoism, which propose that animals, natural objects and even the landscape itself possess souls. By this token, your stag guardian figure could be seen as the spirit of the forest. One of the more compelling aspects of animistic religions is that they generally concern themselves with how we find our proper place in this world, rather than with preparation for the next. Does this interpretation of your work make sense to you, or would you be inclined toward a more realistic approach? SB: It makes sense, but in a way you look at a puzzle when only the border is done – there is so much more inside that completes the bigger picture. I feel everything I do is in preparation for the next, but is that not how we find ourselves in this world. Sometimes I complete a painting and I sit back and look at it and feel as if a little of myself has escaped into it... not my ideas, not my time... but my beliefs. These are things I can't take out of it, even if I wanted to. They are completely saturated in that body of work. It gives it a life... and when people see it, they relate in a sense that it is a life force just like they have inside them. I watch the things around me go inside myself and filter through my belief system, only to come out on the other side a part of me, rather than a separate thing. I am tied to everything... everything is tied to me. EP: Are there any books, movies or music that shed a little light on things for you? SB: I am excited about my show this November. For the future – fitter... happier... more productive. 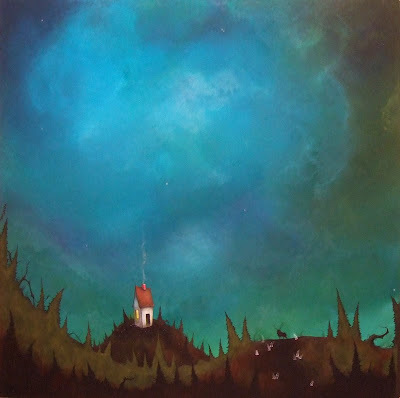 Scott Belcastro's show at Cerasoli:LeBasse Gallery in Los Angeles opens November 8th, and he also has three gorgeous prints available at a Paper Tiger. You can see his work brought to life in this music video for the Swedish electro-ambient group The Deer Tracks. If you'd like to know a little more about what makes Scott tick, there's also a recent interview at Hunt & Gather. – Robert Frost, "Fire and Ice"